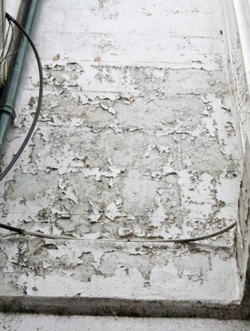 In our experience the two biggest culprits of damp in old buildings are cement and modern, synthetic based paints, so if your property is built in the “traditional” manner, as solid composite masonry, and suffering from damp as a result of modern paint coating/s it could well be that stripping the paint may be the only realistic option open to you. What can be said about Paint Stripping other than for most people, it’s not a job it’s a sentence; as for the rest, they simply avoid it. There are a number of processes for removing paint from masonry walls and each one should be weighed up on its own merits and approached as an exercise in risk/benefit. Regardless of what the paint or surface coating is, the objective will always be the same, to get back to an appropriate surface using the least damaging method available with minimal risk to the operator and surroundings. The method of stripping paint will fall into one of two basic categories, either chemical or mechanical methods. Mechanical Methods - Grit/Blast cleaning., High Pressure water jets – Steam Cleaning, Wire brushing, Needle gunning or other methods involving mechanical abrasion. Grit/Blast cleaning uses a range of wet or dry systems with a wide range of abrasive media, from very coarse gritty materials through to fine talc’s, even nut shells. However, water/air-abrasive systems, even at low pressure can all too easily result in damage to the surface beneath, particularly soft brick and stonework. There are too few contractors out there who have a sufficient understanding of the damage they are likely to inflict on traditional masonry structures from an all too often heavy handed approach many have when carrying out this kind of work. 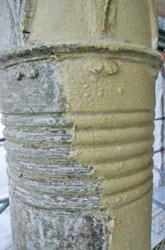 Other forms of mechanical abrasion need to be carefully considered but are unlikely to be effective and nuisance free. However, if there is limewash under the modern coating then the use of an air or electric powered needle gun may sometimes be worth exploring. A needle gun is a potentially damaging tool but used diligently at a pressure to suit the material needing to be removed it can be very effective. But like any other power tool, if used inappropriately it can be most destructful. High Pressure water cleaning is unlikely to be very effective, and could easily result in setting up its own problems from the amount of water delivered into the fabric; bearing in mind that water is the engine of decay. However, systems such as DOFF which rely on a combination of high temperature steam at high pressure are very effective on modern heat pliable paint surfaces; heat from the steam softens the paint, with the high pressure delivery assisting the removal of the paint film, while greatly reducing the volume of liquid applied onto the wall surface. That said from my experience the process can be messy and the equipment somewhat temperamental and as such not a cheap operation. Chemical solutions are based on dissolving the paint with the use of chemical formulations. While these can be a very effective method for removal, there have been widespread concerns around the world in recent years regarding the cocktail of chemicals used within the differing products. Such concerns resulted in the European Union banning the use of DCM’s (Di-Chloromethane) in products sold to the public. *DCM has been classified as a Category 3 carcinogen in the European Community. Cornish Lime now stock an extensive range of DCM free paint strippers and Anti-Graffiti products; produced by Scheidel one of Germany’s leading manufacturers in this field, who have been producing DCM free paint stripping products since the late 1960’s. There are many types of chemical stripper with the more aggressive potions sometimes acting instantaneously while others such as the Scheidel range, applied as a poultice, pasted onto the surface breaking down the paints binders facilitating later removal by scraper or water cleaning, normally after 24 hrs. The Company has an extensive product range to suit a wide range of paint products and our work to date with these products has been very encouraging. Paint removal is not an exact science given the wide range of paints available or the number of coats that have been applied. As such it will be difficult to state which product from the Scheidel range will yield the best results and as such we advocate sample trials to determine the most economical outcome and the following is a brief synopsis advising how we carry out such trials. Our experience to date working with Scheidel products here in the UK to remove masonry and other synthetic paints has determined the two most effective products are the Asur and SG94. Both products are CHC-free (chlorinated hydrocarbon) and work on the basis of slowly exhaling esters and other special solvents that break down the paints binders. These two products are very different in terms of their composition, performance characteristics and price, and exactly which one or how much product will be required are almost impossible to predict and the best way of establishing a clearer indication to those two points would be to carry out in-situ trials as a control measure using as many sample areas as practically possible. For any such sample trials we advise that an area equal or greater than a sheet of A4 paper is identified and marked out. Using a trowel apply at least 3 mm of paint remover at one end and let it run out to nothing at the other end. Cover half the control area with film (e.g. Pallet wrap, cling film etc) note date, time and temperature and check the test area at different intervals to determine the optimum application time and the products open time. If the product does not deliver the desired result, further test applications will be necessary to establish the likely number of applications. The removal of the dissolved coatings should always be done at the optimal dissolving point. The longer the treated coatings remain on the substrate, the more difficult it will be to wash them off. The removal of the paint (for the trials) will be best served by simply scraping the paint off with a flat bladed scraper/knife. Once the paint coatings have been removed the surfaces MUST be washed with the addition of Powerfluid at the dilution of 1: 10 preferably with warm water, using a scrubbing brush or a sponge, once washed with the Powerfluid the same surfaces should be rinsed with clear water: Powerfluid is a detergent cleaner used after paint removal to help neutralise the chemicals. The above process is exactly the same for any of the Scheidel paint strippers being tested. With regards to the actual consumption of the paint remover this will come down to a calculated guess from interpreting the results as finished. Alternatively, following the initial trials it may be worth considering conducting additional trials using the selected product at the optimum thickness to establish a better idea for consumption. Can you send me prices for the paint stripper and the power fluid as I am unable to find this on your site. We have an old cottage which we have been told needs years of masonary paint removed. http://cornishlime.co.uk/catalogsearch/result/?q=scheidel including an article that we've written. If you need any further guidance please don't hesitate to get in touch. Hi , we live in a 15 c timber framed building with the majority of walls cement rendered but a few with lime render. The whole building was painted with masonry paint. Fortunately we have not had damp problems . However , we decided to re paint the house last year and thought that a lime wash would be sympathetic to the building. We did not appreciate that line wash cannot be used straight onto masonry ! Now 2 walls have the lime wash flaking off but the others are mostly ok.
We have been told that we need to remove the limewash and re paint with masonry . Whilst we wouldn't recommend redecorating in masonry paint, i do understand your predicament. To remove limewash i would recommend trying to scrub back the paint with a stiff brush or a churn brush, this should hopefully break down the paint and then it can be washed off. I would try and avoid a pressure washer as this could inject large volumes of water into the render and may cause damage to the render itself. The fact that the limewash has stuck to limewash is strange as it only usually works on mineral backgrounds. 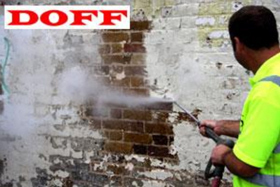 If this doesnt work we have a product called Etching Fluid, which is an acid based cleaner, it is designed for removing latence (free lime) layers before painting, it will likely remove the limewash but could prove expensive.